Electronic sunglasses are what you need if you're tired of those old-fashioned sunglasses that darken the entire lens when all you need is just a small dark spot over the sun. 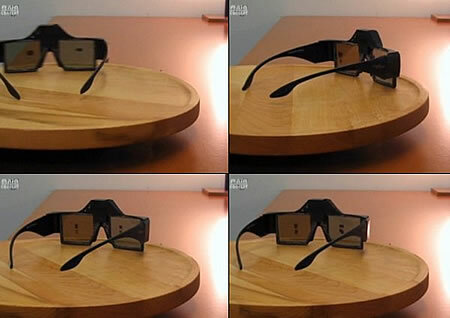 Our revolutionary glasses will fight glare by dimming just the bright parts of the field of view. If you're driving into the sun, they dim the sun, without dimming everything else that you need to see. Because only the sun is darkened, it can be made a lot darker than any other technology (like polarizers or photogray glasses) because those other technologies darken the entire lens. We do it by putting a liquid crystal display in front of each eye and darkening just the spot between your pupil and the glare source. It acts like holding up your hand to block the sun, but with no effort on your part. If the sun moves, then the spot moves, and if the sun goes away, then the spot goes away. We have working prototypes that react faster than you can blink, and can run for a hundred hours on watch batteries. We’re figuring out how to make the LCDs on curved plastic substrates, so they can be built into cool, wraparound style shades. We’re making the electronics so tiny they’ll fit into sporty sunglasses models. We’re building in a wireless recharging capability that’s compatible with the new Qi wireless power standard. We need to squeeze everything into strong, lightweight sunglasses frames that are comfortable and fun to wear. At that moment we went through the weather dome. CY Aquarii, which had been a soft white patch, became for an instant a tiny bright point of agony. Then a spot on each lens of my goggles turned black and covered the sun. Designer Chris Mullin wants these electronic sunglasses to become a real consumer product, and that's why he is trying to raise $20,000 in seed money to go from prototypes to production. Visit his page on Electronic Sunglasses on Kickstarter to read his pitch and make a contribution. 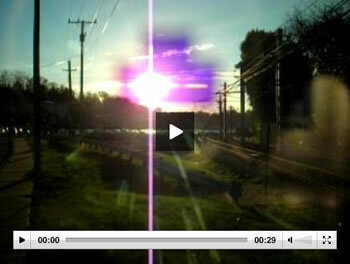 Also, take a look at videos that show the actual view through the electronic sunglasses - see glare-reducing glasses. Thanks to Winchell Chung for the tip and the reference on this story.